Contact with honey is sometimes avoided due to its sweet, sticky nature, but for centuries honey has been used for its healing properties on wounds and rashes. 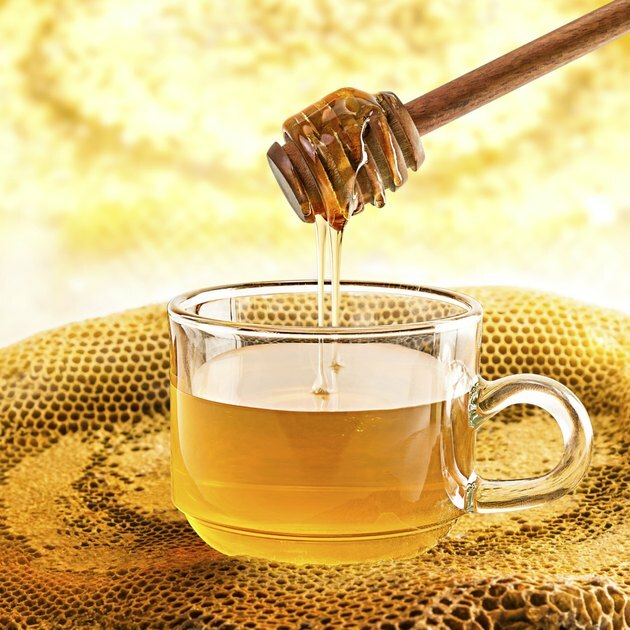 Honey is recognized for its medicinal properties in most of the world in the year 2011, except for the United States, according to an article on the therapeutic uses for honey published in "Journal of Neonatal Nursing" in 2008. Honey is the concentrated nectar of flowers, a natural substance closely resembling the makeup of fruit, according to BenefitsofHoney.com. Unpasteurized and unfiltered, raw honey can include bits of bee pollen, bee wing fragments and honeycomb, and it is high in healthy anti-oxidants -- nutrients that protect your cells. Pasteurized honey, on the other hand, has been heated and filtered, making it safer to consume, according to the U.S. National Library of Medicine, but leaves the honey with less nutritional value. As bacteria grows resistant to more medicines, researchers look to honey for its antimicrobial agents. In a study by Amsterdam's Academic Medical Center, published in "Oxford Journals Clinical Infectious Disease" in 2008, researchers found that medical grade honey produced under controlled conditions worked as a successful topical antimicrobial that prevents and treats skin infections, even if caused by drug-resistant bacterias. Honey enthusiast Dr. Jane Hart suggests these findings may make honey a good treatment for rashes found at catheter sites. Diaper dermatitis, or diaper rash, affects between 25 percent to 65 percent of children, making successful treatments important for many caregivers. In research published in "Clinical Microbiology and Infection" in 2004, 12 babies were treated for seven days with a combination of equal amounts of honey, olive oil and beeswax. The salve was used seven times daily for one week, resulting in an improvement of diaper rash. Researchers credit the acidity and hydrogen peroxide production of honey for some of its healing powers, as well as its ability to increase nitric oxide levels. While honey might be used for topical treatment of rashes from infection, honey might also cause rashes if you come in direct contact with it while you are allergic. If you have a honey allergy and you touch honey, you might either break out into hives or contact dermatitis. Hives, or raised welts on the skin, might be itchy and could produce swelling. Contact dermatitis usually includes redness of the skin where the allergen came in contact, along with watery blisters that can range in size. Honey is not a common allergen, and your dermatologist might do a patch test to confirm your allergy. Antihistamines may also help, but contact your doctor for information on the treatment of allergies. Benefits-Of-Honey.com: What's So Special About Raw Honey?